wow! edgedale, your post here is full of action pack! nice shots! very difficult to track those cars right? what lens did you use for those shots? nice shots! thank for sharing! I like the video best. is that video taken by you? its a nice footage, very seldom see these kind of footage in here. thank you so much for sharing! I get use of shooting fast cars at a slow shutter speed like 1/10 to 1/25sec with handheld. I never like shooting with tripod. watermouth wrote: I like the video best. is that video taken by you? its a nice footage, very seldom see these kind of footage in here. thank you so much for sharing! yeah it was filmed by me when i get tired of shooting prolong period of time. edgedale wrote: I get use of shooting fast cars at a slow shutter speed like 1/10 to 1/25sec with handheld. I never like shooting with tripod. Cool.. you have got stable hands. nice! oh the video, what did you use to capture those footages? Nice! what is the compression rate you used on this video? or none at all? Metalz wrote: Nice! what is the compression rate you used on this video? or none at all? alright, anyway you can try vimeo. what do you think of vimeo? i have seen quite fairly good review on vimeo. APIs? care to explain? sorry for asking this noob questions. hope you don't mind. I am using Apple Aperture and iMovie and i able to export to youtube with it's build in plugins. oh i see! hey are you using macbook or imac? Core 2 Duo? One of the mishap of a race driver captured on still image. Oooo.. the whole bumper is out. cool pal. really appreciate that you are sharing your photos here. One of the driftmaster in action. Metalz wrote: oh i see! hey are you using macbook or imac? Core 2 Duo? I am always on iMac while working and on macbook when i require to shoot on the fly to show my client. that is the shot that you use slow shutter speed on? kudos to you on your stable arms! nice ones! so imac and macbook are better for editing photos and videos than any other brands of PC right? what do you think? for your own preferences. Metalz wrote: that is the shot that you use slow shutter speed on? kudos to you on your stable arms! nice ones! 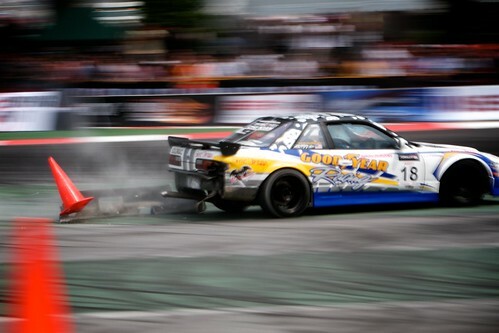 Most of the formula drift shots are all done at slow shutter speed from 1/25 sec to 1/15sec full handheld, no tripod. Well if you ask me... i never trust in PCs and windows platform especially on my field of work. The only trusted and stable platform will be a mac. Well that's me. right, i agree with you, i heard from my friends that mac has fewer virus and hackers attacking the platform and OS is so good at handling softwares and also enhancing the performances. Yes yes. Windows platforms tend to lose out to mac in terms of performances, you have confirmed my doubts, thank!